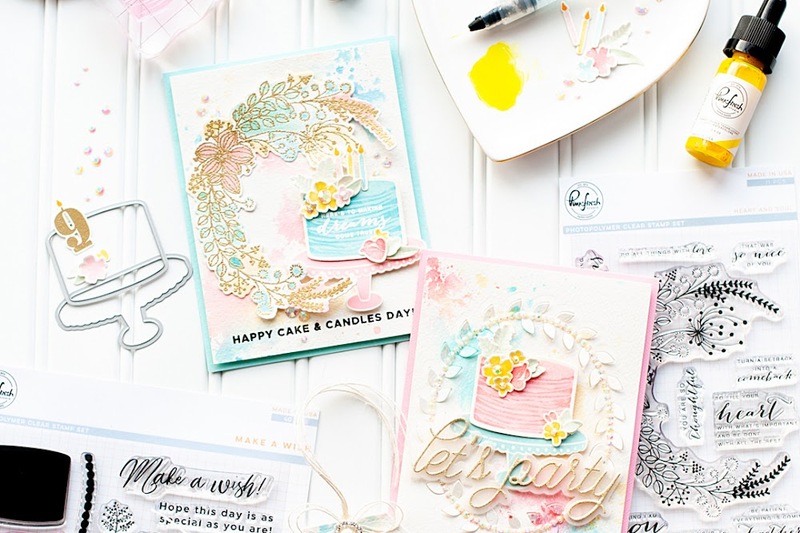 Happy Monday, blog friends! I hope that you had a wonderful weekend! I photographed a wedding this weekend with my hubby as the second shooter, and we had a lovely time! It was a super long, super filled day - but we had such an amazing couple with amazing families...and it always makes the hard work worth it. 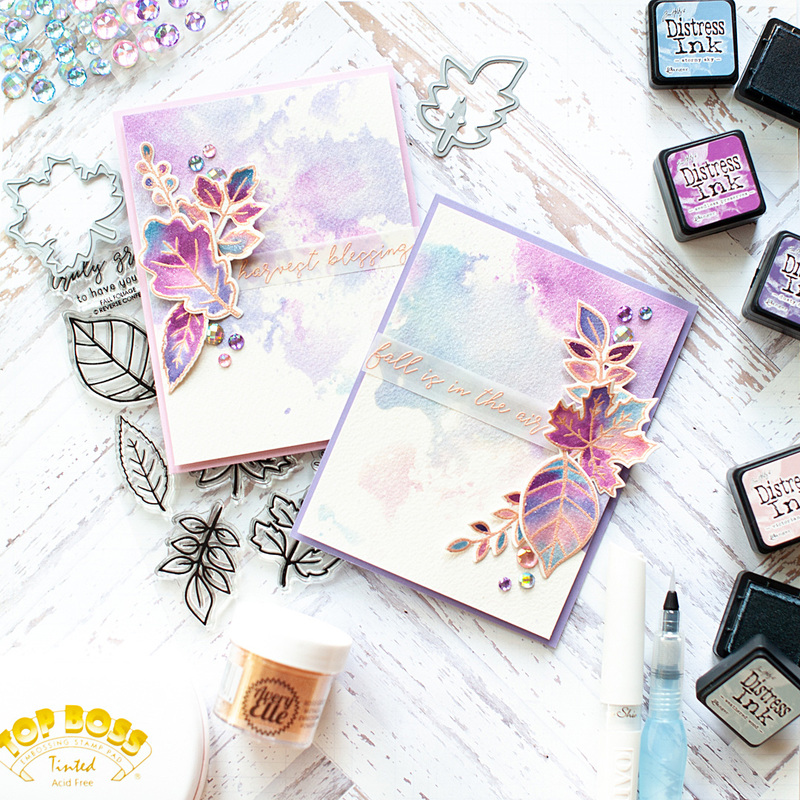 Today I have a card set featuring the new Fall Foliage stamps & coordinating dies from Reverse Confetti. 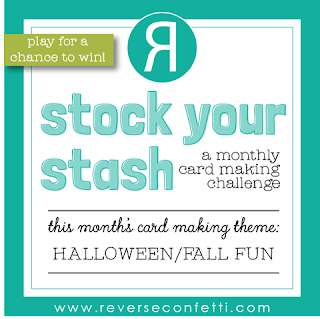 I have created this for their September Stock Your Stash Challenge, which has a Halloween/Fall theme. 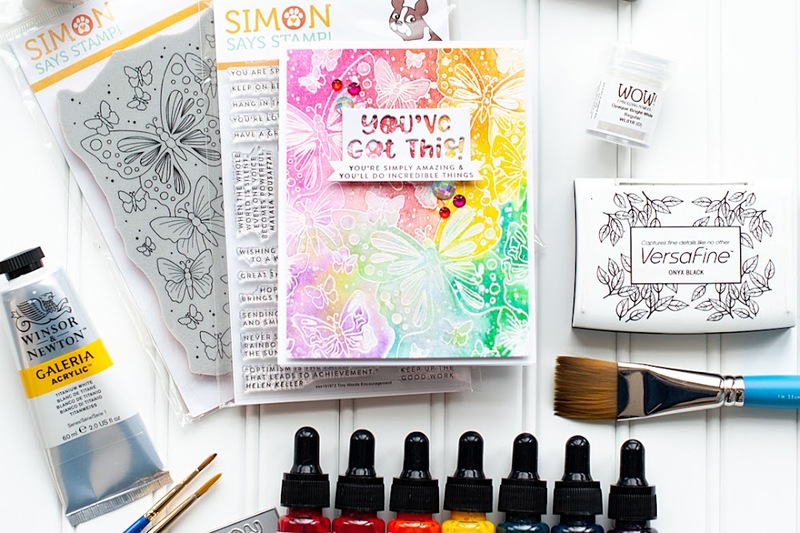 You've got about 4 days left to play along, so be sure to check out the link above for the rules and link up a new project for your chance to win a $20 Reverse Confetti giftcard! 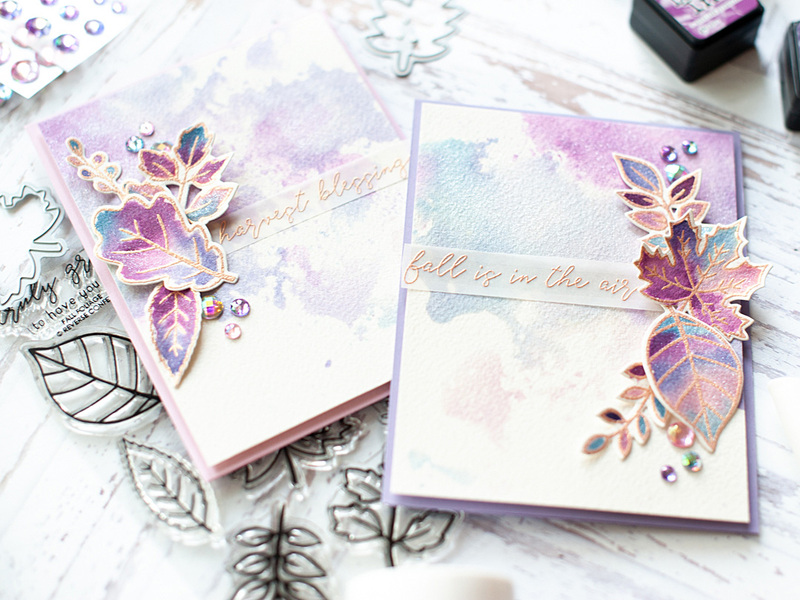 I've created a set of fall themed cards for the challenge, using non-traditional colors Tim Holtz Distress Inks as my watercolor palette. 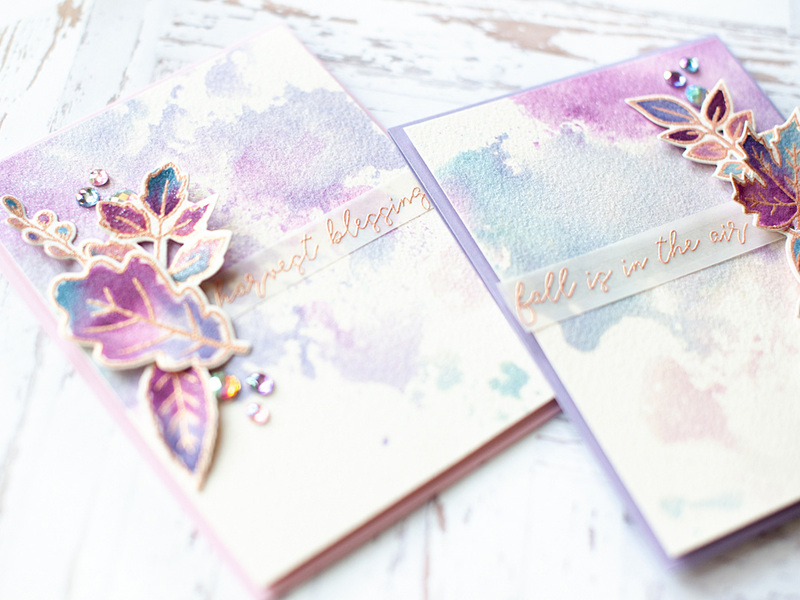 I am really excited about how they turned out, and for someone who isn't the biggest fan of purple (ahem...me. 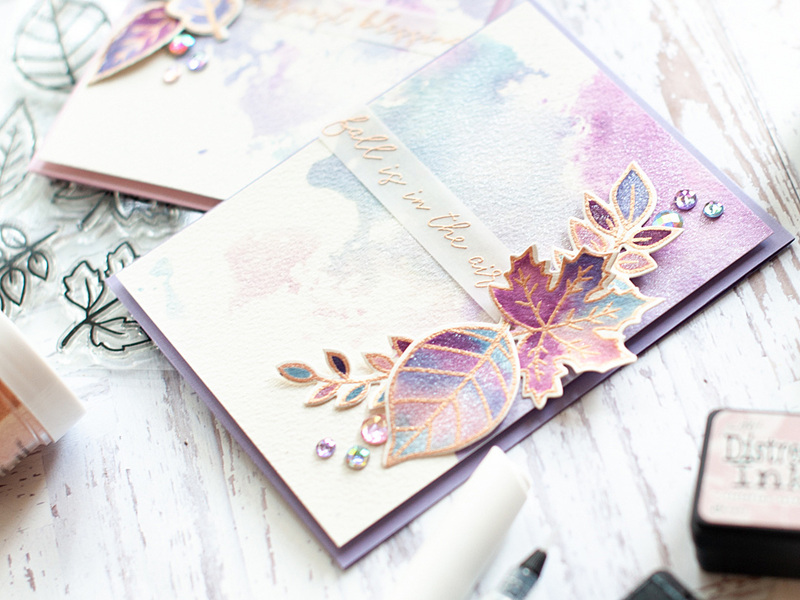 ), I am really loving the colors! 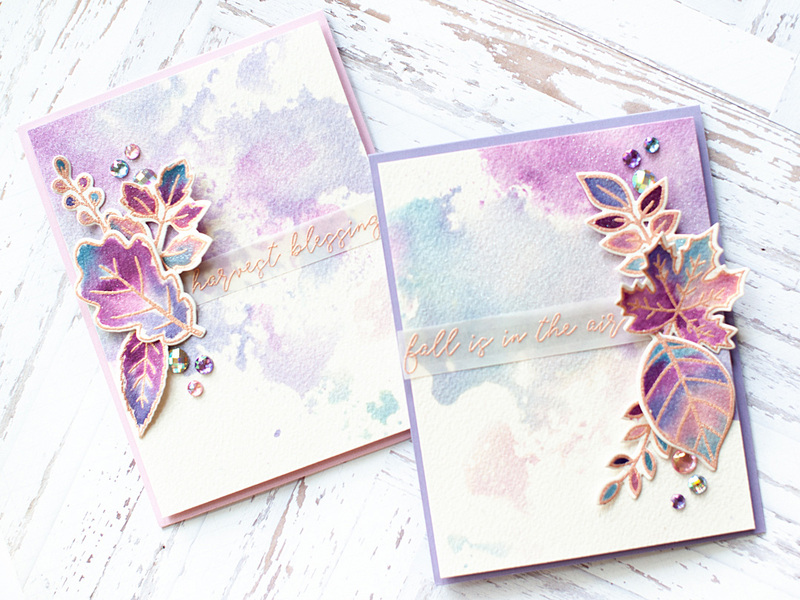 I set those aside to dry, then used the rest of the watered down ink to create the card backgrounds by watercolor smooshing some blocks of the same watercolor paper to it. I let them set a bit, then spritzed them down in some shimmer spray. 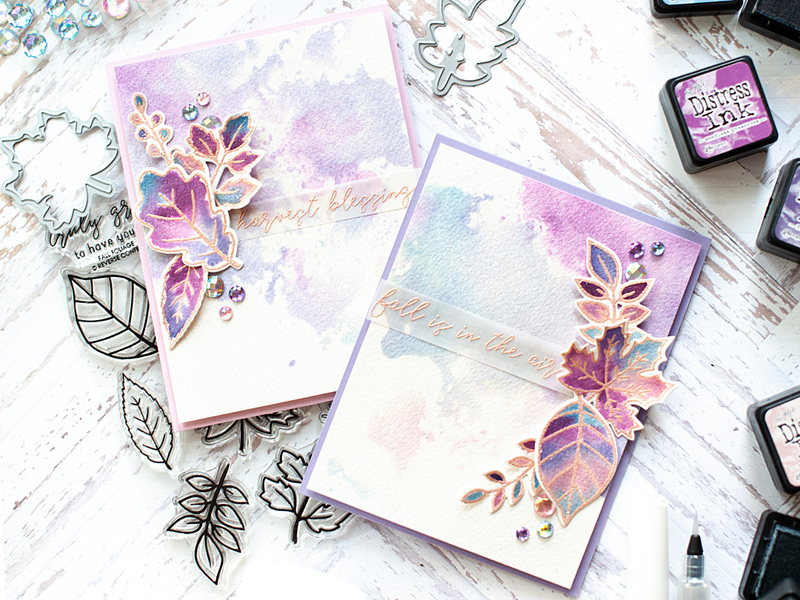 I didn't feel like I got enough shimmer that way, so then I also squeezed my Tonic Aqua Shimmer pens to each one, and pushed the glittery water around each one. 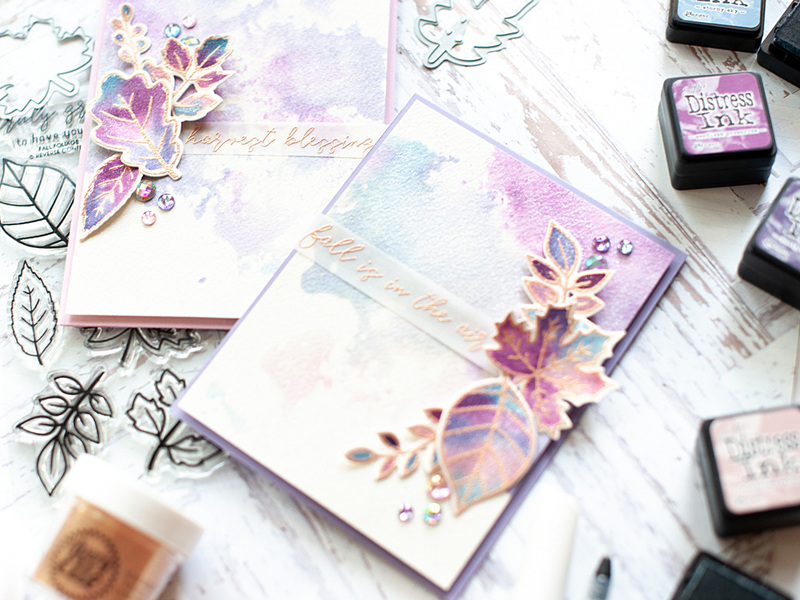 I set the backgrounds aside to fully dry, then cut all the leaves out with their matching diecuts. 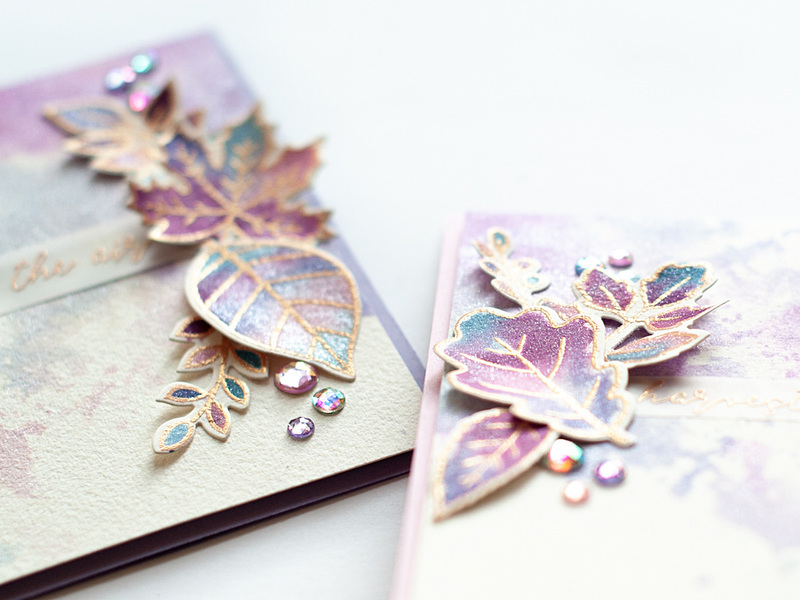 I set those aside, and then stamped & heat embossed the sentiments to vellum in matching rose gold embossing powder. Once heat set, I trimmed them into thin strips. With everything finished, it was time to put the cards together. 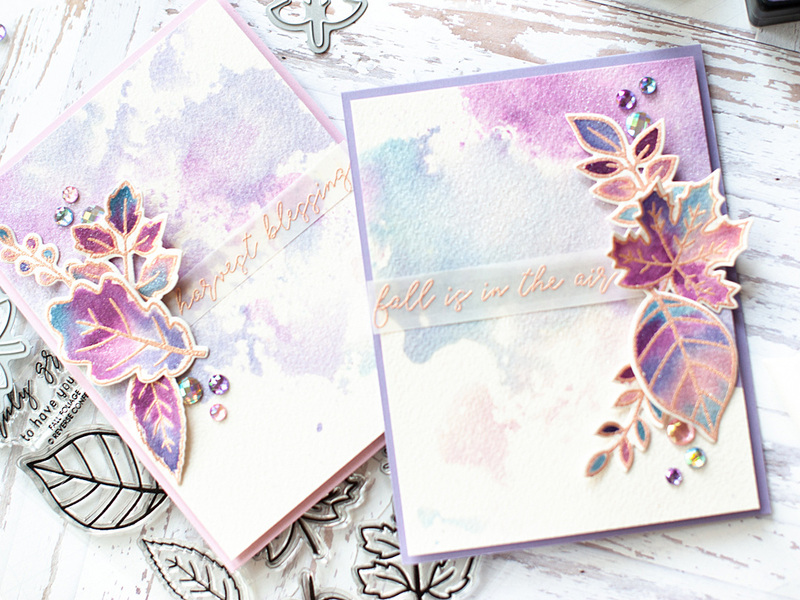 I mounted the watercolor smooshed backgrounds to top fold A2 card bases in Lavender Moon & Winter Wisteria. 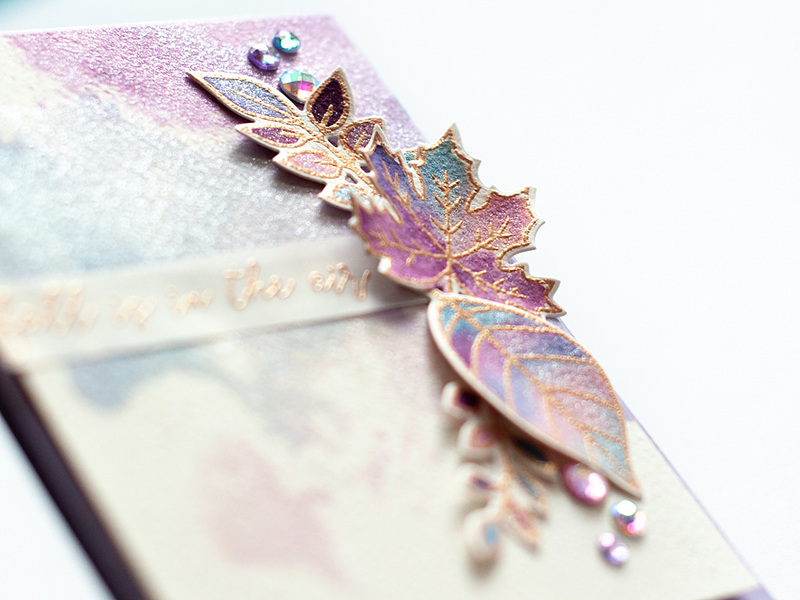 I mounted the sentiment strips to the front with vellum adhesive, then adhered the leaves to the front with mixed media adhesive. Finally I accented with my signature jewels tucked here & there. here is a look at each card by itself. 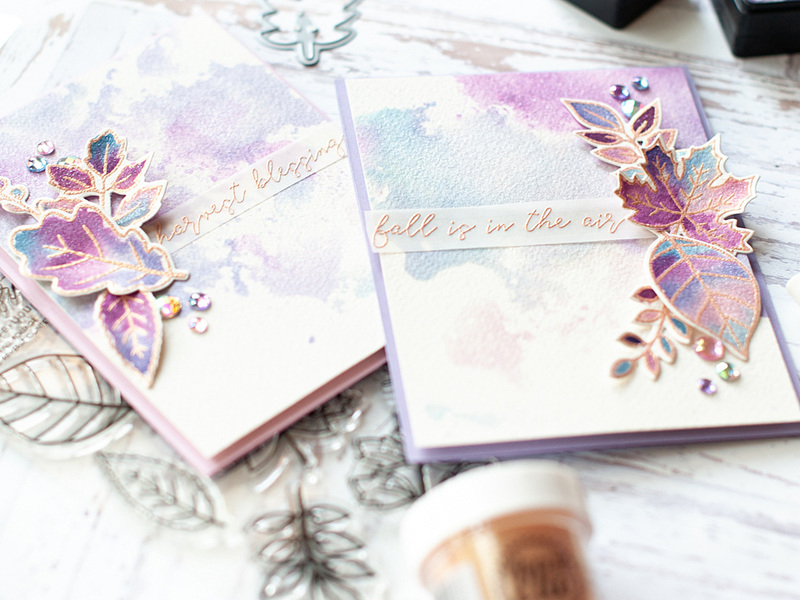 And here is a peek at all the shimmer, which I think you can see pretty well in the video too! I hope you will join in the fun in these final 4 days of the Stock Your Stash challenge at Reverse Confetti! 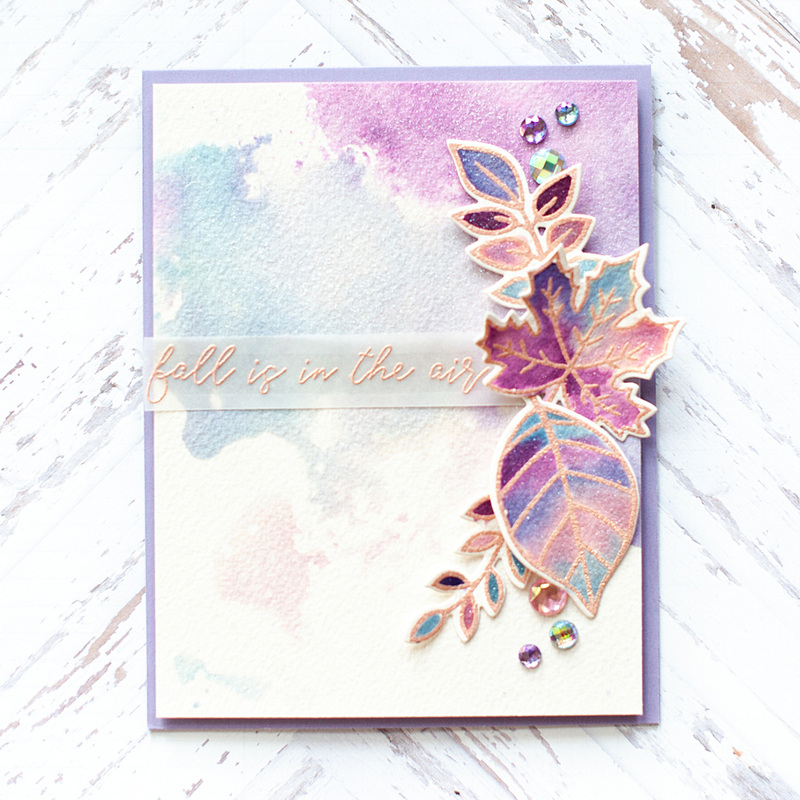 And I really hope you try out some non-traditional color palettes during this fall season - it really is a fun change! 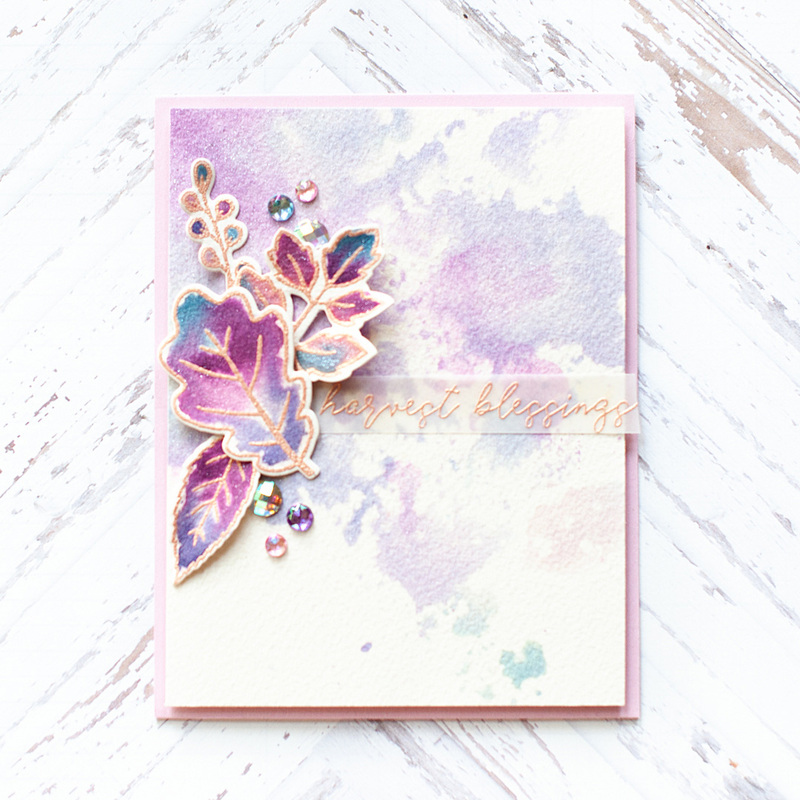 gorgeous, gorgeous cards - love the color combo on these great new stamps! So pretty and so so precious. Lea this is so ELEGANT! 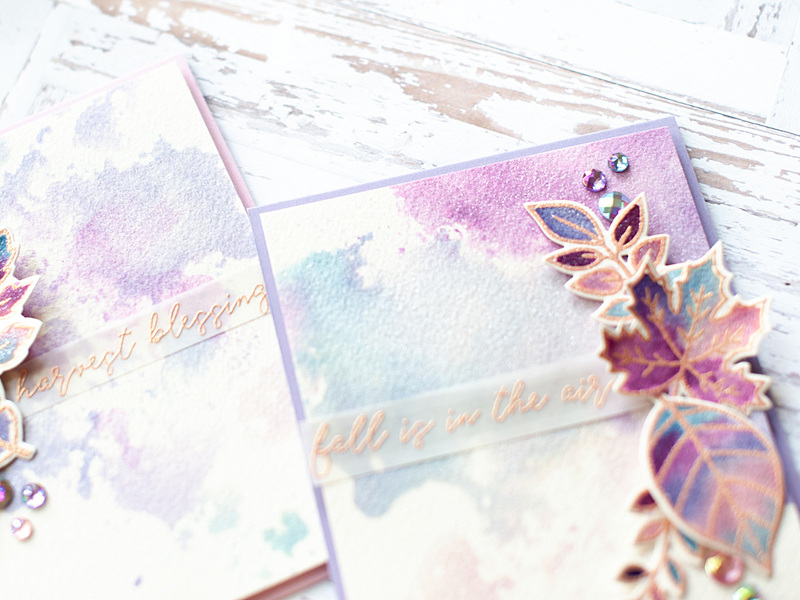 I love the purples and the sparkle of the gold emboss and those yummy faceted gems! Swoon! 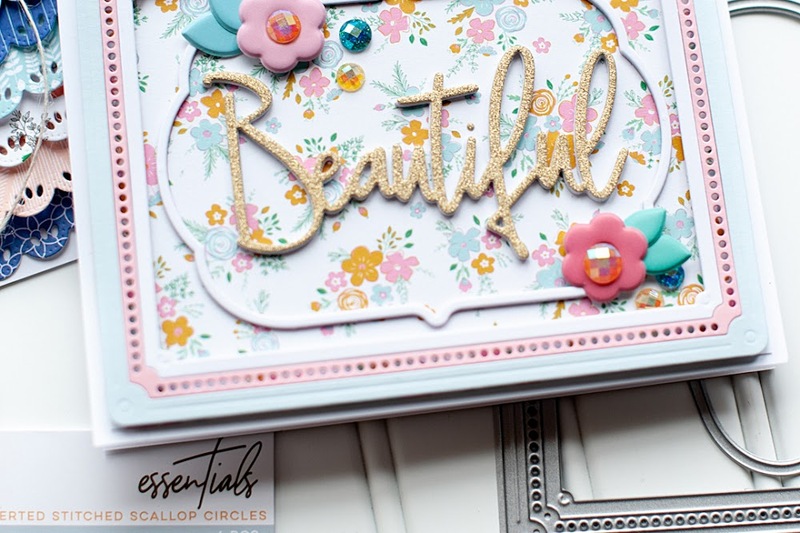 These cards are incredibly beautiful ! 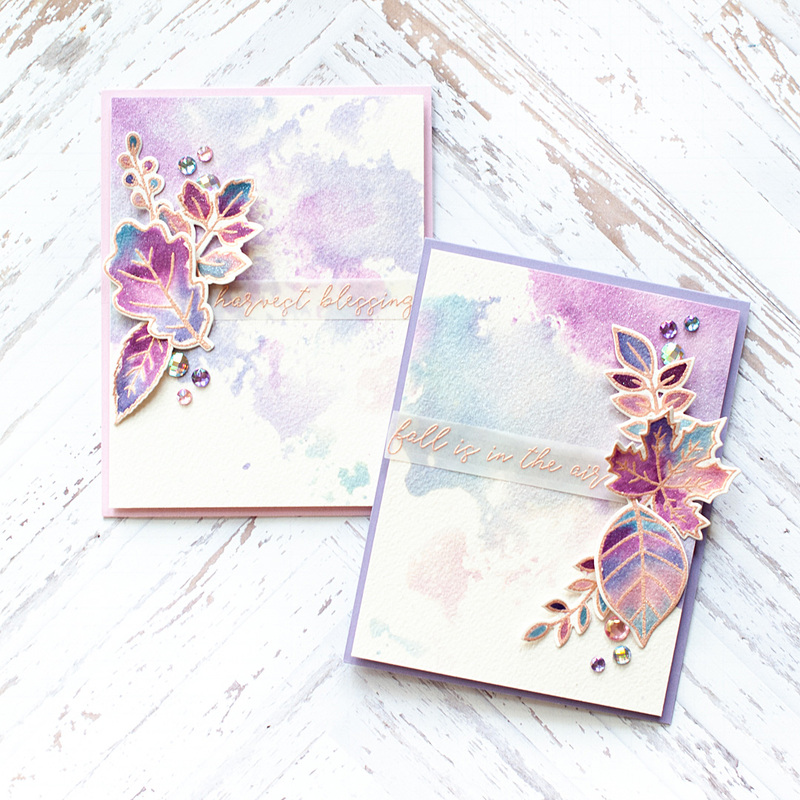 The colors you chose are perfect together ! Congrats !